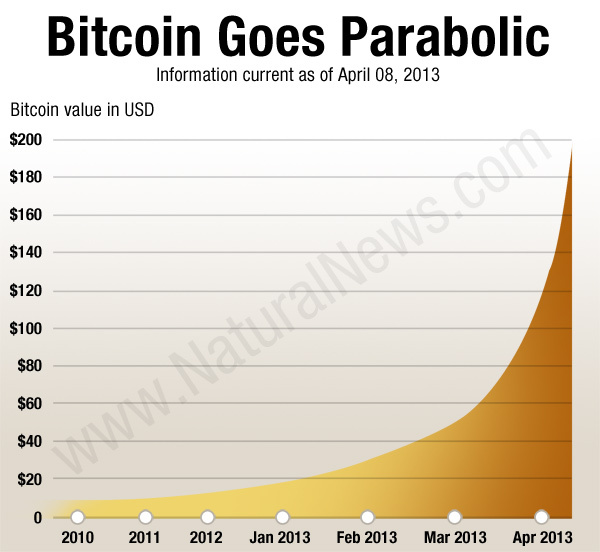 Bitcoin is a powerful, game-changing crypto currency that may literally change the world. It’s a huge threat to centralized banks and government currency controls because it’s entirely decentralized, anonymous and virtually impossible to track. Bitcoin is the “underground railroad” of money, and it has an important role to play in the epic battle between liberty vs. slavery. But because bitcoin is a currency whose value is based on the psychology of human beings, it is subject to booms and busts. Bitcoin has enjoyed a meteoric rise from roughly $20 per bitcoin in February to almost $200 per bitcoin today. (Yes, nearly a 1000% return in less than two months.) This has happened for several reasons, but primarily because the Cypriot bank thefts taught people that “money in the bank” isn’t any safer than money anywhere else. So why not invest in a crypto-currency that can’t be stolen by the banks? As Europeans and Russians were funneling unprecedented sums of money into bitcoin over the past few months, Asians began to dump speculative money into the system. Today, Chinese investors (i.e. “gamblers”) are pumping huge sums of cash into bitcoin, hoping to double or triple their money as the currency continues its red hot rise. If this chart looks familiar, it’s because the exact same thing happened with the dot-com bubble in the late 1990’s, terminating in 2001 with an industry-gutting crash of unprecedented magnitude. Some high-tech stocks lost more than 99.5% of their value overnight. Billions of dollars of wealth vanished almost instantly, and many speculators were wiped out. This means people are buying into bitcoin at such a high rate that even the bitcoin exchanges and wallets are being maxed out. There’s actually a purchase queue! You have to stand in line to buy more bitcoins! Bitcoin’s skyrocketing value looks a lot like the “irrational exuberance” witnessed during the dot-com bubble. That doesn’t mean, however, it won’t keep going much, much higher before a correction comes. Human psychology is very difficult to predict when it comes to greed vs. fear. This spiral of greed continues until the point where greed turns to fear. Once fear sets in, the selloff is unleashed. As the selloff gains momentum, fear turns to panic and the downfall rapidly accelerates, even going to the point of being vastly oversold. Those who are late to sell lose more money than those who sell early, thus motivating everyone to sell as quickly as possible. This is the psychology behind the bursting of every speculative bubble, and throughout history there have been plenty: The tulip bulb bubble, the dot-com bubble, the U.S. housing bubble, the South Seas Company investment bubble, and even today’s bond market bubble. Could Bitcoin reach $1 million? Many bitcoin proponents — such as Max Keiser — think bitcoin could eventually reach $100,000 – $1 million per coin. That would be an astronomical rise over its current value of $180. And technically speaking, Keiser could very well be correct. I’m not saying bitcoin is doomed to crash right now. What I’m saying is that bitcoin is subject to human psychology, and as such it will undoubtedly experience booms and busts that reflect the greed and fear of investors. Personally, I own a few bitcoins, and the Natural News Store accepts bitcoins as payment for physical goods, but I am extremely wary about putting any real money into the system for fear that a sharp correction may spontaneously occur. In China, people are jumping into Bitcoin right now with a kind of “lottery” mentality, hoping to cash in big and “win” free money. This mentality, if it dominates the investment influx, always leads to a bubble and then a crash. There’s also a theory floating around that the central banks are buying bitcoins in order to crash it with a huge selloff, thereby discrediting bitcoins and scaring people away from the currency. It’s actually a very effective tactic, so if this were true it wouldn’t surprise me at all. Personally, I’m a proponent of bitcoins, which is why it’s frustrating to see speculators jumping into the currency and creating a bubble. As a student of history, I know the bitcoin bubble is eventually going to burst, and at that point the mainstream media will jump all over the news, disparaging bitcoin with stories of how so many people “lost everything” by believing in a non-central bank currency. Just wait for it… these stories will dominate the mainstream media when the bubble bursts. How much higher could the bubble go? The tricky thing about irrational exuberance is that you never know the limits of the irrationality. If a whole lot more people are more irrational and jump on board the bitcoin bandwagon, we could see this currency reach $1,000 or more in the weeks ahead. Trying to second guess the irrationality of a gullible public is a fool’s game, and I strongly suggest you take no part in it. At this point, I would not trade dollars for bitcoins. Although there are certainly profits to be made if you happen to time it just right, there are also huge losses to be felt if you fail to properly time the selloff. Smart bitcoin investors are building automatic “stop sell orders” that will sell bitcoins once prices drop below a certain threshold. It’s a smart play because it “locks in” profits. Unlike the U.S. stock market where trading is halted if stock prices begin to limit down too quickly, there are no limits on how quickly bitcoin prices can fall. Bitcoin is a purely “free market” crypto-currency, after all, meaning there are no government controls whatsoever. That’s a good thing, in my view, but it also means the full fury of the free market can be unleashed at bitcoin at any time. This is going to shock today’s bitcoin speculators when the crash finally comes. Most people aren’t running automated stop sell orders, and much of the bursting of the bubble could happen while they sleep. Just as bitcoin’s meteoric rise has made “bitcoin millionaires” seemingly overnight, the value of bitcoins could also drop virtually overnight. There is absolutely nothing in place that would slow a bitcoin crash. Be warned that if you buy bitcoins today, you are essentially playing the lottery because you’re joining other greed-driven speculators who are all unwittingly playing out a repeat of the dot-com bubble. A crash seems inevitable. For the record, however, if more bank failures take place very soon, that could actually cause the value of bitcoins to skyrocket even further. A person who times it all correctly could literally turn a few thousand dollars into a few million dollars if things unfold precisely to their advantage. Conversely, the opposite could also occur: a person who invests millions could end up with thousands if luck and timing turns against them. Be smart. Think before you leap. There will be good opportunities to buy bitcoin in the future, but be very wary about allowing greed to drive your decisions right now.